In my last blog I wrote about ‘The Movement’. I now want to write about what are the values that underlie this movement and what distinguishes it from the mainstream. This is a global phenomenon of existential importance. We live in a world dominated by a value system that is both destroying the very biosphere upon which we depend and which holds a global hegemony. This worldview sees no alternative to consumer driven capitalism, underpinned by the maximization of short term profits and an essentially neoliberal set of economic policies. It sees competition between nation-states as natural and nationalist foreign policy as therefore inevitable, with the defence and security spending priorities that this implies. It also sees very little wrong with increasing levels of inequality, just so long as the rich are getting richer. Economic growth and national self-interest are the key policy goals. Political parties of left and right, the mass media, the financial and business lobbyists all maintain that there is no alternative to this. Meanwhile there is a rapidly growing movement that sees the world very differently. Ecological sustainability and global social justice are the twin principles that drive this movement. It sees the damage humanity is doing to the planet and to ourselves through myriad forms of pollution and destruction and believes that there are better ways of doing things, be it how we generate and use energy, how we build, farm or how we organise our economic and political life. Cooperation is seen as more vital than competition and fairer distribution more important than overall economic growth. The active pursuit of peace and non-violence are key aspects of this movement. We can see these two rival worldviews being played out daily in debates over climate change, economic, social or housing policy, or quite frankly just about anything else. Take the global decline in bees as an example. 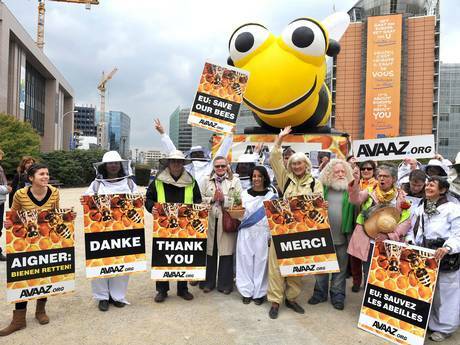 The movement organised globally, but especially in Europe and focused on the banning of neonicotinoid pesticides within the EU. Avaaz, Greenpeace, Friends of the Earth, The Soil Association and innumerable other organisations networked and petitioned, wrote scientific reports and lobbied politicians. Syngenta, Bayer and other agrochemical companies lobbied against the ban. The corporates had the ear of the UK government which voted against the ban, but the EU as a whole, influenced by the citizen’s movement and by the European Food Safety Authority voted in favour of a ban. One small victory for the movement, many more happen daily, many more campaigns ahead. Some of the organisations involved in campaigning for bees http://www.gardenorganic.org.uk/news/news_topic.php? This entry was posted in Environmental, Global, Politics, Social on 31 July 2013 by Richard. In my last blog I wrote ‘I feel strongly a part of something very big and very little understood’ a movement that stands for ‘real social justice, real democracy and real ecological sustainability’. For me it is a source of optimism and hope, and it is as I said last time, of ‘profound significance’. It does not have a single name. In the 1980’s we talked of ‘The Green Movement’ and ‘The Peace Movement’, now there is ‘The Global Justice Movement’ and many other terms. This movement manifests in virtually every country on earth. The internet and other digital technology allow us to work in powerful new ways. Avaaz launched in January 2007 and now has over 24 million members in 194 countries and perhaps better than any other single organisation gives the movement global expression, but it must be stressed that no one organisation gives leadership or is in control. Some estimates put the number of organisations that are part of this movement at somewhere around 10 million, ranging from the tiny to the vast, the locally focused to the globally focused. Here in Herefordshire we have many groups, some loosely coalesce in the Herefordshire in Transition Alliance. Things are kicking off this week in Brazil, Turkey and Egypt, and all in part reflect this movement. One of the defining principles of this movement is the absolute rejection of all forms of violence. On the streets things get messy as members of this movement mix with others with very different agendas. As ever we have to hope that the forces for peace and justice prevail in the end. This entry was posted in Global, Local, Social on 3 July 2013 by Richard.